The up and coming poker site will run a total of 17 events with buy-ins ranging from €10 to €200. The OFC Grand Prix will start on May 8th with the €10 buy-in, €1,000 guaranteed Pineapple tournament and conclude a week later with the €5,000 guaranteed Main Event. “The Tonybet Poker name is getting bigger each year and keeps establishing strong presence in the online poker market. Both our online and live events received very good remarks from the players, which gives us confidence to continue the good run,” the Tonybet Poker representative Warren Lush said. For the first two years Tonybet Poker was known as a poker site dedicated solely to Open Face Chinese driving the fans of the rising poker variation to its online tables. However, back in November they have decided to up their game with the addition of six-handed Texas Hold'em and Pot-limit Omaha cash games and tournaments. “The addition of the two most popular poker variations was a natural step forward expanding our gaming supply and allowing our players to choose the games they want. We’re also expanding to new markets where having Texas Hold’em and Omaha helps us introduce Open Face Chinese to wider audiences,” Mr. Lush explained. 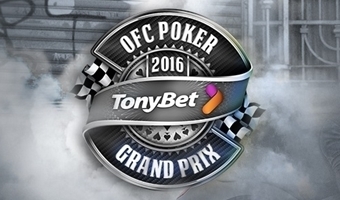 The Tonybet Poker representative also announced that the site is going to present its players with the chance to play one of the OFC Grand Prix tournaments for free. According to him, both new and existing users to take advantage of the bonus code GRANDPRIX10 and fund their account with at least €10 will be automatically registered to the €1,000 guaranteed Event #1 taking place of May 8th at 5pm GMT. The upcoming OFC Grand Prix tournament series will be looking to continue the success of last year’s event which broke records in both the player field as well as the prizepools. It was the High Roller event which became the richest online OFC tournament in history and it was none other than the recognized OFC pro Sergey Rybachenko who took home the record-breaking first-place prize. The site is already running satellite tournaments and freerolls giving away seats to the OFC Grand Prix Events allowing the players to qualify for the series free of charge or just a fraction of the original buy-in. The third annual Tonybet Poker OFC Grand Prix Tournament series is set to take place from May 8th to 15th hosting a total of 17 Open Face Chinese poker events. It will feature four of the most popular OFC variations including the hit Pineapple, Turbo as well as 2-7 Pineapple and Progressive Fantasy. For more information about the series, the tournament schedules, prizes and the ways to qualify, visit the OFC GrandPrix page.